Whether your horse is for pleasure or performance, keeping him structurally balanced improves his athleticism and well-being. Spinal misalignment shows up in many ways, from obvious pain or lameness to changes in behavior such as when a good horse suddenly starts misbehaving. The problem usually begins as something quite subtle long before obvious symptoms are seen. Sport and performance horses, like any athlete, are subject to intense physical challenges and can easily misalign; the spine loses flexibility, muscles become stiff, and mobility is restricted. Tight or fatigued muscles are at higher risk of strains. Compensation and weight referral compound the issue until the horse that had just seemed slightly “off” is now truly uncomfortable or worse. The misaligned horse may be unable to pick up a lead or travels with an inverted frame, bucks or swishes his tail during transitions. Training issues often have their roots in pain. Pleasure horses and companions are equally susceptible; rough-housing with herd mates at pasture, slips and falls, or that occasional weekend warrior ride on an unfit horse can have you scratching your head looking at a “mystery lameness”; your horse is no longer feeling or moving quite right. Just like us, horses greatly benefit from keeping physically tuned up with regular structural alignment and massage to help injuries heal and maintain optimal movement. This therapy program is designed to bring healing, comfort and to improve the quality of life for any and all horses, whether your equine partner is a fuzzy best friend in the backyard or the highest calibre of competing athlete. 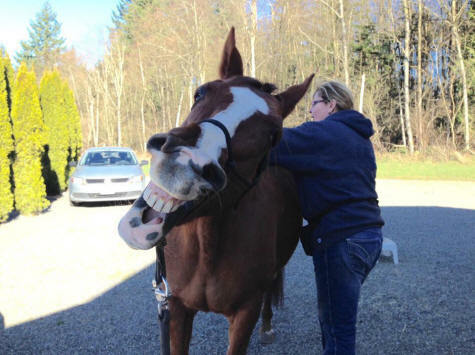 Would my horse benefit from equine therapy? 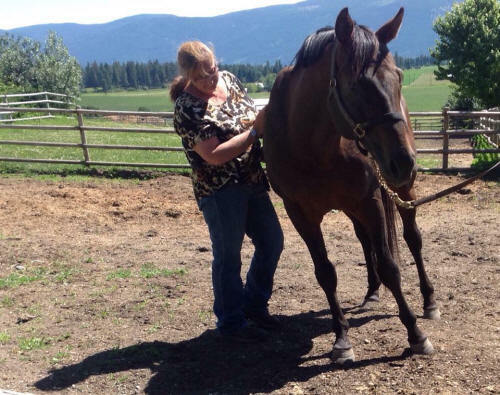 "Gottcha Gold after breeding 26 mares his first year here in Canada, loves his massage and adjustment from Ainsley! Gottcha Gold aka Brian turned from a standoff stallion into a cuddly, happy, content stallion." Is your horse exhibiting any of these signs of misalignment? When the spinal vertebrae are misaligned the nerves traveling out from the spinal cord become irritated and lose some ability to function properly. Areas of the spine become more rigid, muscles become tight and sore. Spasm or splinting of muscles protect an injured joint from moving through its range of motion and as mobility is affected, performance and ability decrease. Over time, as flexibility is lost, the synovial fluid lubricating the joint decreases, the joint lining becomes less lush and flexible, and eventually arthritis may set it, with permanent consequences. Nerves effecting your horse’s internal organs may also be impeded in subtle ways, such as difficulty in gaining or holding weight or supressed vitality. As the horse becomes uncomfortable, stiff, and resistant, pain or fear of pain causes him to change his posture and move incorrectly. Protecting the compromised area creates further discomfort and damage due to the added stresses of weight referral. By adjusting the spine back to its optimal alignment, nerves and muscles begin to return to normal and quality of movement is improved. The body can find its way back to homeostasis, the natural balance of health and vibrancy within every living creature. During a session, structural alignment is integrated with acupressure to release stress points. These areas quickly relax, bringing relief to the associated tissues. Massage further softens the affected muscles, increasing blood flow to maximize healing. With blood flow, oxygen and nutrients are carried into the cells, toxins and lactic acid are carried away, helping the body to heal itself more efficiently. Gentle stretches are also utilized, to increase flexibility and help muscle memory adjust to the improved range of motion. Stretching also helps the horse trust that he can once again move the affected area comfortably. 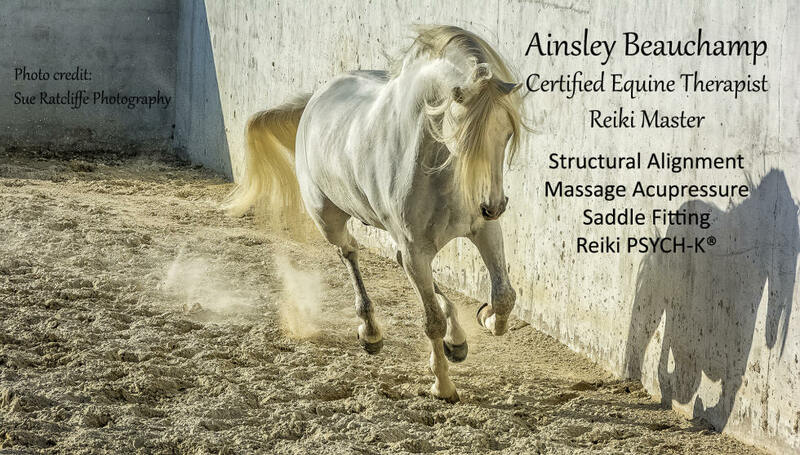 Reiki works to enhance the body’s natural healing response and to calm the nervous system – and horse, allowing the body to accept the changes more readily. A session takes between 45 minutes to an hour, and is a free flowing incorporation of all the techniques described above, depending on the horse and what is most needed in the moment. You’ll be asked about a detailed history of your horse, including primary complaint, the type of work the horse does, medical history, any previous injuries, veterinary care, surgeries, medications, x-ray and/or flexion tests results. Your horse is walked and trotted out for gait analysis and to assess possible lameness issues. Physical exam involves palpating for misalignments, muscle tension, soreness and stress points. 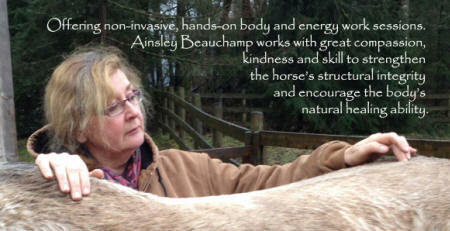 Body work, including adjustments, acupressure, massage, stretches and Reiki. Homework: follow-up instructions for after care depending on the individual case. *Please note: Equine Therapy is the first line of defense for your horse’s wellness; if an issue is showing up that requires medical care or is beyond the therapist’s scope of practice, vet or veterinary chiropractor consultation will be recommended. Equine therapy is not intended to replace traditional veterinary care, but is a great complement to it. Owners who suspect their horse might be having an urgent medical problem, acute, significant lameness or injuries, acute neurologic conditions, fever, colic, or other medical disorders should seek care from their primary veterinarian first. As a body work professional, an equine therapist cannot diagnose or prescribe; when in doubt, always consult your veterinarian first.